As long as I can remember, I have struggled with body image issues. All throughout my school years, I was always the big/fat/chunky/chubby/amazon woman or what have you. I was 5’9″ and 210 at my heaviest. I have also struggled with anxiety and depression for most of my life. When I was 19, I went on a one month food cleanse/detox per my naturopath and 5 months later, I was down 70 pounds. I was now 5’10” and 140-145 and felt and looked amazing, however at the time I still felt self conscious. I look back at pictures of what I used to look like and I just want to kick myself for wasting all that time hating a gorgeous person… Fast forward to November 10, 2011, I was 21 years old and via 3 week early induction and then emergency c-section due to pre eclampsia (at one point I gained over 20 pounds in one week from fluid), my son was born. He is my WORLD and has changed my mind and heart for the better… however, he also changed my body, completely and drastically. 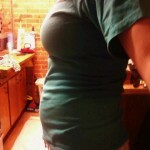 Due to stress, pre eclampsia and laziness, I gained over 100 pounds throughout my pregnancy. I stopped looking at the scale at the doctor’s office but I am now almost 6 months pp and 220 pounds, 80 pounds overweight. I don’t even feel like myself anymore, I can’t even look at myself in the mirror without feeling immense pain and grief. I don’t want to wear maternity jeans and sweatpants and huge tshirts all the time, I feel like a big bum and it doesn’t help my depression. I went from a size 3/5 jeans to not even being able to wear a 14; size small/medium shirts to large/xlarge. I have shopped in the plus sizes for the first time in my life. I am exclusively breastfeeding and not losing any weight! I’m even eating healthy, gluten/wheat/dairy free for my son. I just want to love myself for what I look like now. I don’t want to be worried that I’ll never find a man to love me. 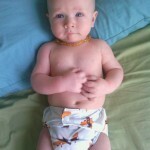 I want to feel comfortable in clothes and be a great positive example for my son. I just don’t want to be in pain when I think about my body. 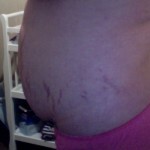 I haven’t even seen any other mom with stretch marks like mine, or who had the weight gain I had. I wouldn’t want to take anything back though, my baby boy is my entire world, I can’t imagine ever living without him and he completes me. Even though I feel ugly on the outside, I am a changed person on the inside. I love my mind now, and that has to count for something. 7. me now at 220 pounds. I hear you…it’s hard having been slim and healthy and to go to being a “bigger” girl…but you know what, your son is gorgeous, you’ve got a beautiful smile and we’ll get there again with time and intention. Lots of love to you, beautiful Mama. Oh and, Breastfeeding!! Way to go!! I also EBF and for an entire year I didn’t lose a single pound, but as soon as I stopped nursing my son, I began to lose weight. I know a few other women who also didn’t lose any weight until they stopped nursing. Hang in there mama! You have a beautiful body! It brought such a beautiful and precious baby into the world! Your son is adorable! I know how you feel– it is so hard to have your body go through such a radical transformation in such a short time. And of course it takes longer going the other way– it’s an evolutionary survival tactic to hang on to extra weight. Loving your mind and heart DOES count for something. Even when your body is perfect if you don’t love what is inside you will still be miserable. Go for walks–even small ones, and work your way from there. Finally, if it makes you feel any better, you are not alone in the stretch mark boat. Mine are like yours, but I have more of them! Good luck Mama! Stay positive! I completely know what you are going through. I was skinny like you before I got pregnant. Size 5. Had my daughter 6 years ago and now I am a size 14. I’ve just kept getting bigger and bigger. I’ve never said in public what size I am and it actually feels good. I gained 85 pounds during my pregnancy so I’m not surprised my body kept some of it around. Thank you so much for posting your pictures, I felt lime I was reading about and looking at my myself. I feel much better knowig I am not alone in the daily struggle to learn how to love a new (larger lol) version of myself. Know you are not alone and that you helped one other fellow young mom feel better about her body. I am loved by my family no matter what the number in my clothes say. We are all on the same boat. I used to weigh 115 and was a size 3 and i never wore a 2 piece bikini cuz i thought i was fat! Now I look at my pictures and I literally start crying and I want to just rip my belly out! I have a 2 year old daughter and I’m 23 and i now weigh 150! I honestly think its all these magazines and music videos that trick us to this image of what a women is suppose to look. I think that’s why we thought we were fat when we were actually in the beat shape ever. You ARE BEAUTIFUL! It’s hard to love yourself, but totally possible. In pic 5 your stretchmarks look amazing – like flames! It could be a work of art; they are beautiful. I have three children and my youngest is six months. I have had the same stretchmarks since my eldest now aged ten and someone said they are like tiger claw marks either side of my belly. I am cool with that! I had Pre E from 32w with my last pregnancy. 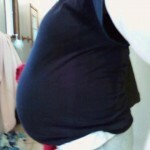 I delivered at 37w 5d because my blood pressure went up to 212/156. I labored for 21 hours and then delivered via emergency section. Pre E is extremely scary and life threatening to you and your precious baby. It also causes you to gain a TON of weight, no matter WhAT you do. I was gaining 5 lbs per WEEK consistently over the course of the two months. I gained between 60-70 lbs total that pregnancy. I couldn’t control it. I ate mostly salads. It was all water retention in my legs, arms, face, etc. So PAINFUL! Now, I’m 15 months pp and currently 8 months pregnant again. This time around, being pregnant has helped me lose those last 15 lbs that I couldn’t shave off before. I’m in pretty good shape now (with a big pregnant belly). It takes time!! My weight loss stalled after my first child around 4 months. Then I started losing weight again around 6-7 months pp. I really want to get back to my pre-pregnancy weight again. I miss my old body! But, I’m being patient with myself. You created a life and you nearly DIED doing it. Be proud of what your body has accomplished. Everything else will come with time. I promise. You *are* still beautiful. I want to say, as a disclaimer, that it’s perfectly fine not to be concerned with culturally-defined aesthetics. I know a lot of people who aren’t, and more power to them! But many of us have feelings about these things, and while we may not be able to stop having feelings, we can to some degree manipulate those feelings. That’s how we get brainwashed in the first place. Well, we can re-brainwash ourselves (for lack of a better term.) It involves looking at positive representations of our size, and seeking out clothing that is specifically made to flatter our size. You know, most clothing manufacturers are lazy and just blow up the pattern when they size up. They don’t account for different proportions. So clothing that is designed for thin bodies doesn’t look good on us. But then, there are also manufacturers that do make clothing specifically for fat people but don’t have a clue as to what works and what doesn’t. The result is tent-like shaping. What is hilarious is that they then use thin models to advertise them, but the clothing doesn’t even look good on the thin models! Because it’s just terribly designed period! My suggestion is to start looking for fat-positive design on Pinterest, Tumblr, and blogs. There is so much of it, and it is so encouraging! It really helped me reshape my definition of “beautiful”. (It was a bit of a shocker when it first starting happening, for me to realize that perception *is* relative and fluid.) And it helped me to accept my own body as good and figure out how to clothe it in a way that makes me feel good. I weighed 145 when I got pregnant with my first son at age 18 and 232 when I delivered him. I hated my body before I got pregnant and complained all the time! I wish I had it back now :( My stretch marks are so deep you can feel them through a shirt and they were black (I’m a white chick lol).He is 4 now and the stretchies faded some. 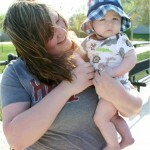 When my baby was 14 months his dad left me and in just a few months I found a man who is crazy about me! I did lose some weight (I weigh 190 and I’m 5’6) but I’m not worried about it! We have another baby now and we are all happy. I don’t let my post baby body rule my life and you shouldn’t either. Thank you for your honesty. I am going through almost the exact same struggle; I was slim before I got pregnant with my second kiddo and I just can’t lose the weight. It helps me to know that I am not alone.